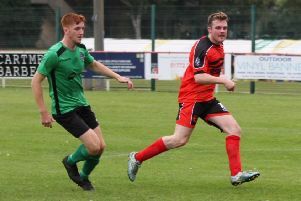 The Riversiders were back on the road, making the journey down the M6 to face a relatively unknown side who had beaten Lostock in the previous round. Baker used the game as opportunity to refresh a few of the starting XI and give opportunities for players to stake a claim for a regular starting berth. On a compact pitch, it was clear from the early stages that Garstang were the superior technical side and had most of the possession in the first half. Chances came and went for Garstang as a combination of good goalkeeping and wasteful finishing kept the game scoreless. The deadlock was broken when Murphy got behind the St Helens defensive line, rounded the keeper and slotted home for Garstang’s first. Murphy nearly extended the lead as Garstang were in total control but was adjudged to be offside after converting Entwistle’s curling free-kick. Despite Garstang’s dominance, some sloppy play was creeping in and some of the off-the-ball running was not to the usual high standards. Against this backdrop, and totally against the run of play, a St Helens breakaway down the right saw their winger get to the line following a neat one-two. The ball was pulled back for a simple tap-in from four yards out to level the scores at 1-1. Salisbury cut inside and fired just over the St Helens bar before Coar also headed over the bar from Graham’s good cross. During stoppage time, and in what proved to be the final play of the half, Garstang deservedly restored their lead when Entwistle shot home from 25 yards following a half-clearance. Leading 2-1 at half-time, the Riversiders continued in the second half where they had left off at half-time. Two minutes into the half and Murphy was on hand at the back post to turn the ball in after a Frith cross was deflected by a defender straight to the unmarked Murphy. To Garstang’s credit they didn’t take it easy and take their foot off the gas. Keeper Curwen was only really called into action once, making an excellent save at full stretch to deny the hosts a second goal. At the other end Garstang continued to press home their advantage by creating numerous other chances as St Helens started to lose their shape. Dodd went agonisingly close after just turning a superb Salisbury cross past the wrong side of the post at full stretch. As the half progressed Garstang killed the game off with further goals by Murphy, who completed his hat-trick in the process, and Salisbury to make the scoreline a truer reflection of the game.